Bonus offer: $500 cash back if you spend at least $3,000 in the first three months of opening your account. The Chase Ink Business CashSMÂ card is a remarkable value for a business credit card with no annual fee. You’ll earnÂ 5% cash back on the first $25,000 a year spent at office supply stores and on internet, cable and phone services. These categories align nicely with the sort of everyday spending done by the average business owner. Additionally, you’ll get 2% cash back on the first $25,000 per year spent at gas stations and restaurants, along with 1% cash back on everything else (and on all purchases in these categories past the $25K/year higher earning limit). Looking for a great business credit card with no annual fee, but lack the 690+ credit score needed to qualify for the card? Consider the Capital OneÂ® SparkÂ® Classic for Business instead. While you’ll be earning cash back at the unsexy rate of 1% on all purchases, the Spark Classic for Business has one attractive aspect most business credit cards lack: you can qualify for the card with a credit score of just 630. American Express Blue BusinessSMÂ Plus currently carries the most impressive introductory APR offered by any business card in this troubled land: 0% for 15 months. That’s 65 weeks. 1.25 years. You get the picture — the Blue Business Plus gives you a nice long stretch of time in which to make business purchases without racking up any interest charges. For this, we must doff our caps to the suits at Amex. Your Amex Blue Business Plus rewards points can beÂ redeemed for travel, shopping, or a statement credit. The American Express SimplyCashÂ® Plus business card is our pick for best rewards program due to the customizable reward structure. With the SimplyCash Plus, you earn 5% cash back on your first $50K per year on charges at office supply stores and on wireless telephone services purchased directly from U.S. service providers. Now, here’s where the customization comes in. Another factor boosting the appeal of the Ink Business Preferred rewards program is the fact that if you redeem your points for travel via Chase Ultimate Rewards, your points will be worth 25% more than they would otherwise be worth. You can also transferÂ your points to certain other travel rewards programs (such asÂ United MileagePlus and Marriott Rewards) on a 1:1 point basis. The American Express Business PlatinumÂ®Â card isn’t a card for the business owner who travels only infrequently. But if you’re a heavy-duty business traveler interested in fancy luxuries (like getting to hang out in exclusive airport lounges), this is the card for you! First off, this card is a charge card, meaning you can’t carry a balance from month to month — your entire balance comes due on your statement date.Â Furthermore, the card carries a $450 annual fee. This is sure to put off all but the most prolific business travelers. For the rest of you, here’s where the card’s value lies: You’ll earn a juicy 5 points to the dollarÂ on flights and prepaid hotels purchased on Amexâs travel website, amextravel.com. Want a travel-oriented business credit card without an exorbitant annual fee? The Bank of AmericaÂ® Business Advantage Travel Rewards World MastercardÂ® may have an irritatingly long name, but it provides a solid set of travel perks and benefits, and there’s no annual fee at all. With the BofAÂ®Â Business Advantage Travel Rewards World MastercardÂ®, you’ll earn 1.5 points for every $1 spent on all purchases with no limits to the amount you can earn. But wait! It gets better. Earn 3 points per dollar spent when you book your travel (car, hotel, airline) through the Bank of America Travel Center (powered by Orbitz). When you enroll in theÂ Business Advantage Relationships Rewards program to get that rewards bonus, you can earn up toÂ 2.62 points to the dollarÂ on your regular non-travel purchases if you play your cards right, which means all the more points you can redeem for statement credits to pay for your travel! TheÂ Capital OneÂ® SparkÂ® Cash for Business card charges no fees on balance transfers, and beyond that, it’s a great cash back card as well. The beauty of Spark Cash for Business is the fact that you’ll earn an unlimited 2% cash back on all purchases — one of the only cards offering such a high flat cash back rate. If you want to avoid extra charges for balance transfers while earning 2% cash back on everything you buy, this card has your number. However, there is a $95 annual fee after the first year, and there’s no introductory 0% APR for balance transfers. If a 0% intro APR for balance transfers is more important to you than fee-free balance transfers, check out Ink Business Cash, as its 12-month 0% APR period goes for balance transfers as well as purchases. 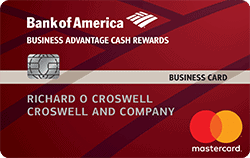 For this section, we wanted to highlight the Bank of AmericaÂ® Business Advantage Cash Rewards MastercardÂ®. For no annual fee, you’ll get 3% cash back on your first $250,000 per year in purchases at gas stations and office supply stores (and 1% cash back afterwards),Â 2% cash back on purchases at restaurants, and 1% cash back on everything else. The $250,000 limit on your highest earning categories goes well beyond the limit placed on the high earning categories of most cards, making this a great cash back business card choice for the business gearing up to do some truly heavy spending in the specified categories. What’s more, just as with theÂ BofAÂ Business Advantage Travel Rewards World Mastercard, Business Advantage Relationship Rewards clients get a 25% â 75% rewards bonus on the base earn of every purchase. We’ve gone over some of the reasons why we like the Chase Ink Business PreferredSMÂ card so much. Here’s another reason: the card carries a sign-up bonus that is uniquely valuable for the industry. Sign up for the Ink Business Preferred and you’ll be in line to receive a bonus ofÂ 80,000 points if you spend at least $5,000 within the first three months of opening your account. This offer is worth about $800 under normal circumstances but is worth $1,000 if you redeem your points for travel via Chase Ultimate Rewards. The post Best Credit Card Offers For Businesses: September 2018 appeared first on Merchant Maverick.